One piece rotor double flux type has few constraints on the dimensions. 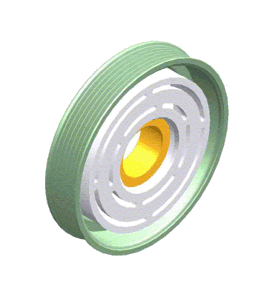 Since it can be made in small diameters, it is used in variety of clutches. Also, by adding friction material on the friction surface, life can be extended. 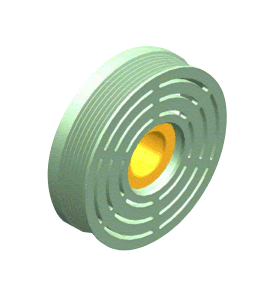 Two piece rotor double flux type is a rotor onto which stamped pulley is welded by electron beam. It’s very cost competitive and light weight. By adding friction material on the rotor, life can be further extended. 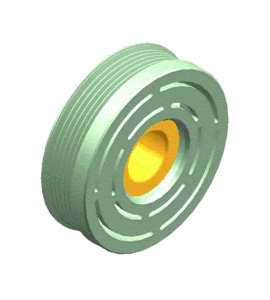 One piece rotor triple flux type has radially three banana slots, which make the clutch compact while achieving high torque.